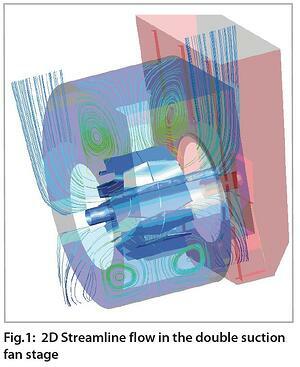 Our client is one of the leading turbomachinery manufacturers. In this project, they asked ADT to perform a complete stage analysis of a double suction fan stage, then redesign the fan impeller using the inverse design code in TURBOdesign1 in order to improve the aerodynamic performance. The design and analysis of an existing double-suction fan stage including inlet ducts, connecting channels, impeller and volute, with the redesign of fan impeller for improved aerodynamic efficiency. Redesign of the impeller geometry. The stage efficiency was improved by up to 4 points. A parametric study was performed using TURBOdesign1 in order to find the effects of the design parameters on the fan performance. The geometrical constraints were to reduce manufacturing costs and included a constant thickness (airfoil shape was not acceptable), straight filament blade geometry and low to moderate stacking shape. 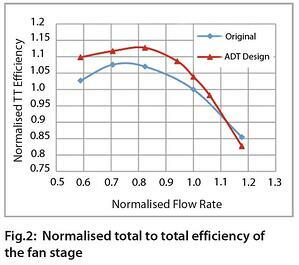 Stage analysis of the double-suction fan with the final redesigned impeller showed significant improvement in the efficiency (about 4 points at design point) and improved stall performance as shown in Fig. 2. Would you like to learn more about how you can optimize your fan performance? 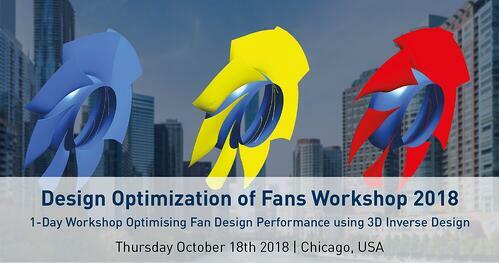 The event will bring together engineers and designers interested in the unique capabilities of 3D Inverse Design technology applied to the design and optimization of axial, mixed-flow and centrifugal fans. Learn more about the workshop now.